I think the first time I had plantain chips, I was in high school. I was highly suspicious of them because at the time I didn’t really care for bananas and I was certain these banana-looking chips would taste like everything I didn’t like about bananas. We were all young and dumb, once upon a time, weren’t we? 🙂 It’s hard for me to describe the taste of plantain chips, but I do know they are addictive. They have also been elusive to me over the last decade or so. They would show up at Cuban or Argentinean restaurants, but I don’t frequent those very often. Once I got an order of tostones, thinking it would be my beloved plantain chips. I was wrong. It’s a thicker cut of plantain and tasty in its own right, but not at all like the thin and crunchy wafers I was looking for. Plantain chips from the dried fruit or bulk area of my grocery store were never what I wanted. A bit too thick, a bit too sugary, the chips left me disappointed every time. Recently I was on a Jet Blue flight from Austin to Los Angeles, and to my surprised delight, Jet Blue offers plantain chips as an in-flight snack. YES, PLEASE! 🙂 As I was snacking away on the flight, I began to ponder the possibilities of making my own plantain chips. Surely it could not be that hard – especially if the package I was eating from only listed three familiar ingredients: plantains, oil, and salt. So after spending the weekend experimenting, I am pleased to bring you easy-to-follow instructions on how to peel, slice, and fry your own plantain chips. For me, the hardest part was figuring out how to peel those suckers. They do NOT peel like a banana at all!! I had to go to the World Wide Web for help with that bit. Since I’ve figured it out, I’ve made several batches of plantain chips. I may need an intervention. I played around a bit with seasonings, so I’m happy to share the results of those taste tests with you as well. 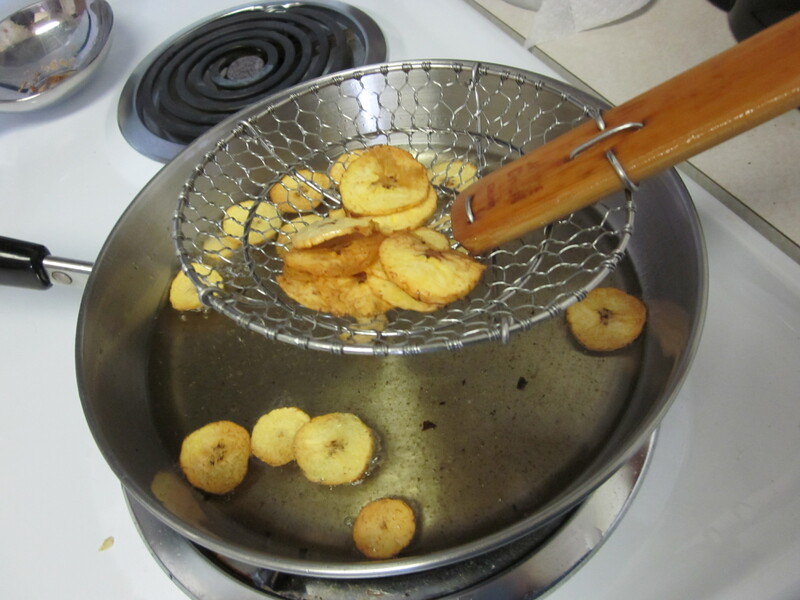 I have no doubt you’ll soon be making your own plantain chips, too! 1. 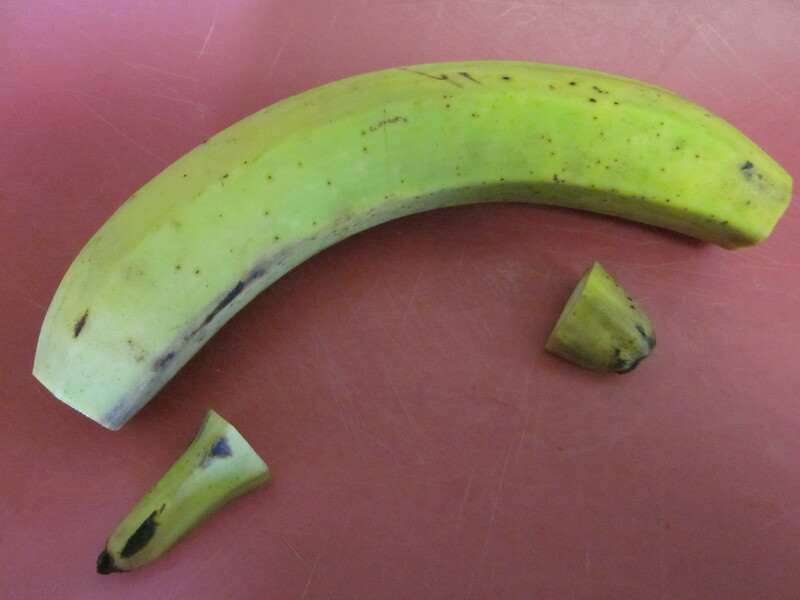 To peel the plantain, slice both ends off and cut in half – like a hot dog, not a hamburger. With the tip of your knife, score the peel – trying not to cut into the fruit. Score thin strips all the way around the fruit. It will come off easier in thin pieces. Flex the peel to get a finger or the edge of the knife between the peel and the fruit, and gently peel it off. Repeat until all the peel is off. 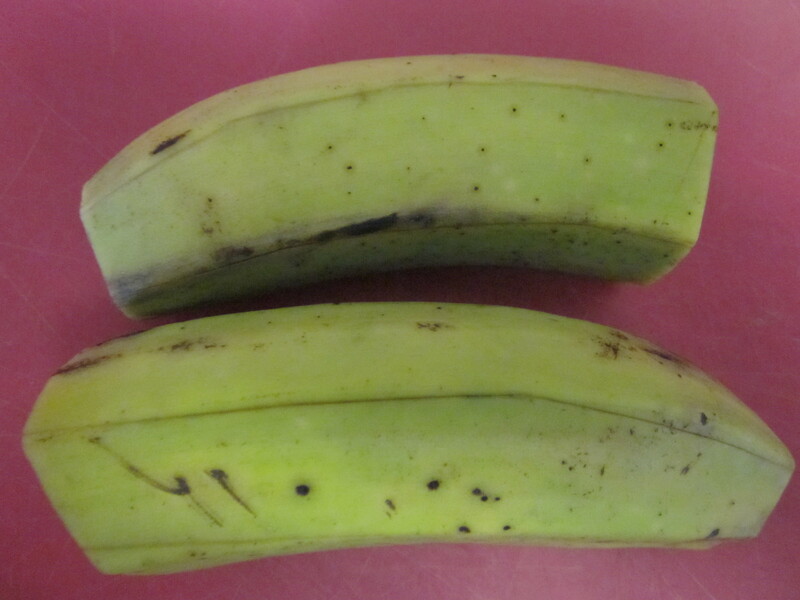 Green plantains are harder to peel than yellow ones. However, once past this step, the green ones are easier to work with overall. 2. Pour about ½ inch – ish of oil into a skillet and heat. 3. I used a mandoline because I have one – the same job could be done with a knife, though. 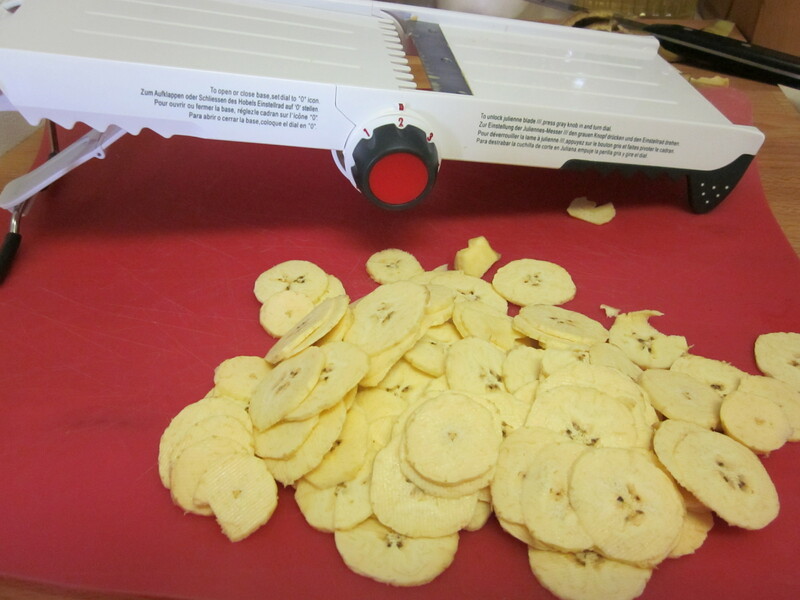 Set the mandoline on 2 and slice thin, but not paper thin, slices of the plantain. Watch your fingers! Food slices wicked quick on the mandoline, and I don’t want you to get hurt. 4. 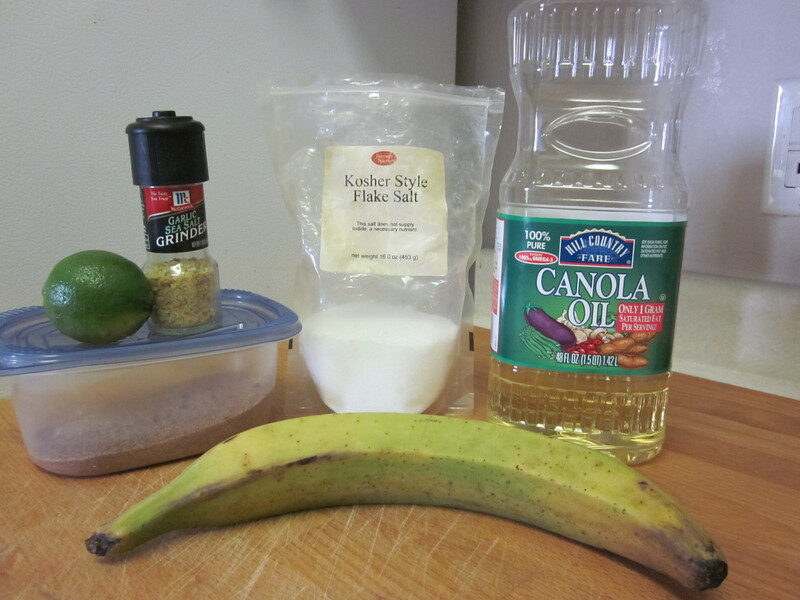 Put one slice of plantain into the oil to see if it’s hot enough. (This is what one does when one does not use a thermometer.) If it is, carefully put a handful of sliced plantain into the oil, one at a time. If you put them in all together, they will stick in one big, unfortunate clump. 5. Let them fry, and stir them about a bit – I left mine in usually no longer than a minute or so. With a slotted spoon or a spider, take them out, and let drain on paper towels. 6. Season as soon as you put them to drain. Your seasoning will stick better this way. 7. Repeat until finished. I give you permission to snack as you work! Sadly, the lime zest was not as successful as I wanted it to be. I’m not certain why this is, but the zest doesn’t seem to stick to the chips. If you carefully lift up a chip with zest on it, it does taste tropically delicious. However, if you transfer the chips from their paper towel to a bowl, all the zest will fall off, and you will have a moment of disappointment. The various salts and other seasonings I tried seem to work pretty well. My favorite is probably the cinnamon sugar variety. Yes, they are fried so they aren’t the healthiest of snacks – they certainly aren’t the worst, either! I’m uncertain how to figure out the nutritional content of fried foods as of yet so I consulted the database on My Fitness Pal and learned that for an ounce or 32 – 35 chips, the nutritional content was more or less the same. The numbers I’ve provided are an estimate, but they seem to be an educated estimate. While it’s probably not the best for me to eat a whole plantain’s worth of chips in one sitting, it seems like this could be a good snack for mid-afternoon or accompaniment to dinner. They are thick enough for dipping in most salsas or dips. So if you aren’t flying Jet Blue or eating at a Cuban restaurant anytime soon, don’t despair. 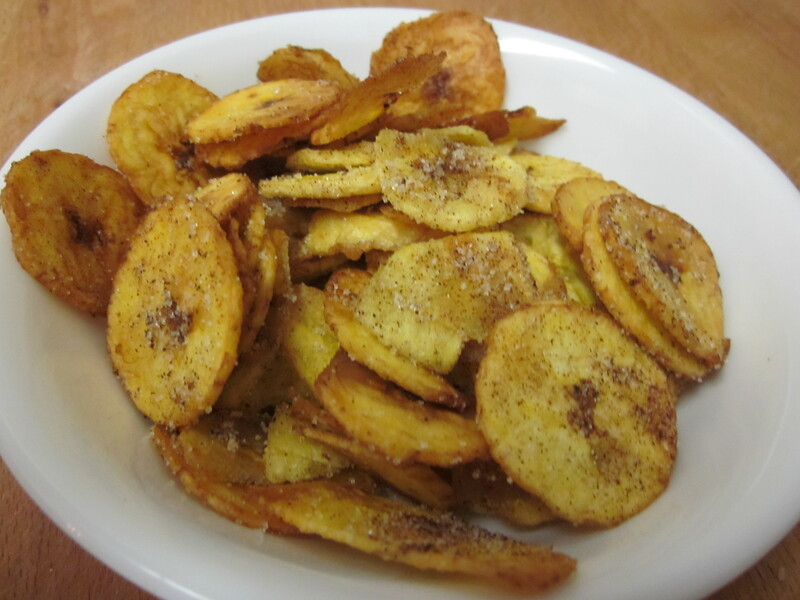 It is actually quite easy to make yourself some of these deliciously crispy plantain chips. Happy eating!! I have never eaten a really crispy plantain. The only way I have ever had them is sliced about 2 inches thick. You fry them on one side, flip, and then squish them. Sprinkle with salt. I’ve never had a sweet plantain, so the cinnamon and sugar variety is tempting. Goodness, but you are just opening up a new world of plantain enjoyment possibilities for me. So fun to read this! I lived in the Dominican Republic for a little while before college, and as I was reading I could remember exactly what they tasted like. Compared to the rest of Dominican food, plantain chips always felt a little greasy to me, but I bet they wouldn’t upset my stomach at all now! We used to eat them for dinner, since dinner was usually just a small snack before bed. How do I know if its hot enough? I’m supposed to be checking but I don’t know what I’m checking for.